Fears of a double-dip recession in Britain may be over, thanks to the sudden wealth of job openings in England’s managerial ranks. Joining the post that nobody wants — manager of England’s national team — is the toxic task that only the clinically insane would consider with a straight face — manager of Chelsea Football Club. And it’s all fodder for analysis in this week’s pod from the Men in Blazers. 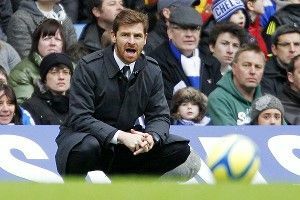 After offering a tearful goodbye to Andre Villas-Boas as he sets out for other prepubescent adventures, Michael and Roger work their way down the Premier League table and dissect the biggest storylines from the weekend. The blazered men consider matrimony for Mario Balotelli, Liverpool’s penalty woes, and the magisterial form of part-time American bassmaster/full-time Fulham’s leading goal scorer Clint Dempsey. What will it take for America to care? Someone please get him on Dancing With the Stars. Michael Davies and Roger Bennett host Men in Blazers live on SiriusXM Ch. 92/207, Mondays and Fridays at 9 a.m. EST. Follow the show on Twitter, Tumblr, and Facebook, and sign up for the GFOP newsletter.